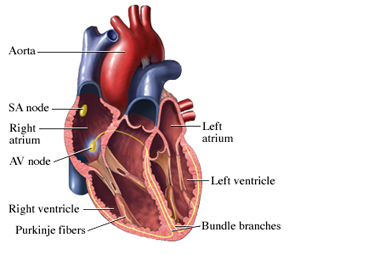 Electrical signals in your heart make the heart muscles contract, pumping blood through your body. If the electrical signals are not flowing well through the heart, this can create serious problems. An electrophysiology study is a test where electrode wires are passed through a blood vessel and into your heart. This electrode can record or create electrical activity. This can help find any problems with the flow of electricity in your heart. Talk to your doctor about any medications, herbs, or supplements you are taking. You may be asked to stop taking some medications up to 1 week before the procedure. Do not eat or drink anything after midnight the day before your surgery, unless told otherwise by your doctor. A local anesthetic will be given by needle. It will numb the area where the catheter will be inserted. You will also receive a mild sedative through an IV in your arm. This will help you to relax during the test. You will be asked to lie down on an examination table. Electrodes will be placed on your chest. The electrodes will help to monitor your heart rhythm during the test. An area on your thigh, neck, or just below your collarbone will be cleaned. A thin electrical wire will be inserted into a blood vessel in that area. The electrode will be passed through the blood vessel and into your heart. The catheter can be viewed with the help of x-rays on a screen. The tip of the electrode can send electrical signals to your heart. The signals will make the heart beat at different speeds. Your heart rhythm will be recorded to look for abnormalities. The tip of the electrode can also record electrical activity at specific spots in your heart muscle. The length of the test will vary based on what your doctor is investigating. The test may take 2-4 hours or more to complete. If an arrhythmia is induced, you may feel palpitations, shortness of breath, chest discomfort, or you may even lose consciousness. The medical team can usually control arrhythmias with medications, but they may need to administer a shock to stop some rhythms. If they need to do this, you will receive more sedation so that you do not feel pain. If additional procedures are not needed, you may be able to go home after about 6 hours. However, you may need to remain in the hospital for up to 24 hours if additional procedures are done during the study. ECG and blood studies may be done. You will likely need to lie still and flat on your back for a period of time. A pressure dressing may be placed over the area where the catheter was inserted to help prevent bleeding. It is important to follow directions. You will need to rest in bed until the sedative has worn off. Your heart rate and blood pressure will be monitored. You will also be checked for swelling or infections. If necessary, you may be given pain medication. After resting for at least 4-6 hours, your doctor will let you know if you can go home that day or if you need to be admitted for more treatment or observation. If you are discharged on the same day as the test, you should have someone drive you home. The results of the study may be available before you leave the hospital or in the next few days. Your doctor will notify you if you need any treatment. When you return home, avoid lifting heavy objects. Do not engage in strenuous exercise or sexual activity until your doctor clears you to do so. Electrophysiology studies (EPS). American Heart Association website. Available at: http://www.heart.org/HEARTORG/Conditions/Arrhythmia/SymptomsDiagnosisMonitoringofArrhythmia/Electrophysiology-Studies-EPS%5FUCM%5F447319%5FArticle.jsp#.WpchEWrwZQI. Updated September 2016. Accessed February 28, 2018. Electrophysiology studies. Texas Heart Institute website. Available at: https://www.texasheart.org/heart-health/heart-information-center/topics/electrophysiology-studies. Accessed February 28, 2018. Warning signs of a heart attack. American Heart Association website. Available at: http://www.heart.org/HEARTORG/Conditions/HeartAttack/WarningSignsofaHeartAttack/Warning-Signs-of-a-Heart-Attack%5FUCM%5F002039%5FArticle.jsp#.WpchgGrwZQI. Updated January 11, 2018. Accessed February 28, 2018.